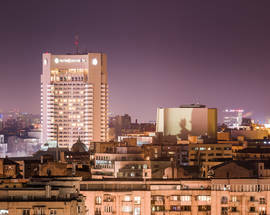 It was Bucharest's first skyscraper, and for more than 30 years the tallest building in the city. 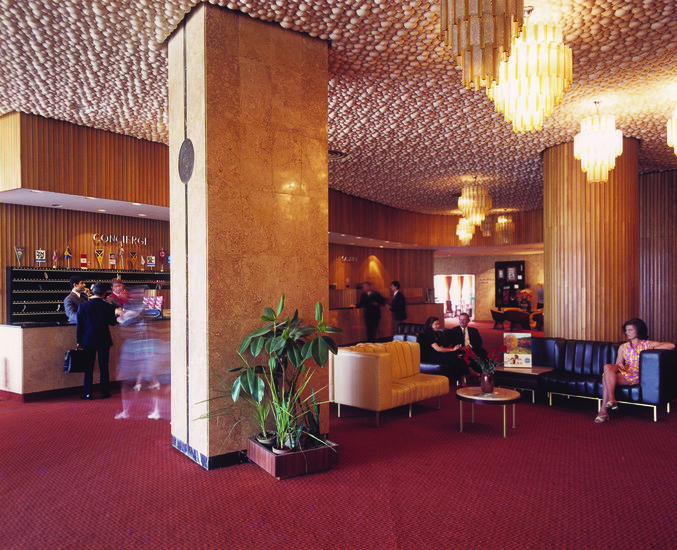 A starring role in the Romanian Revolution and the subsequent chaos of the mineriada made it one of the most immediately recognisable hotels in the world. Journalists still feel a pull to the place when in Bucharest, as if staying anywhere else will mean they miss the big story. 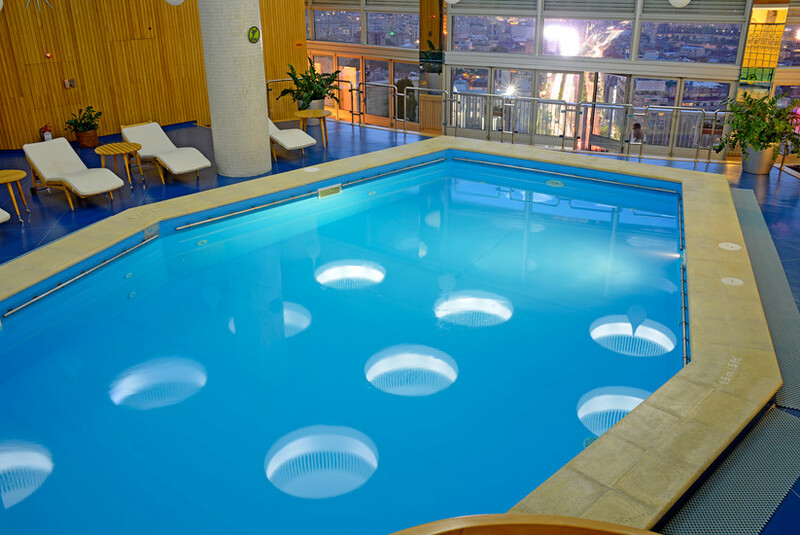 Its swimming pool is on the 22nd floor, and perhaps the best-loved Romanian comedy film of all time, Nea Marin Miliardar, was filmed in its vast Imperial Suite. 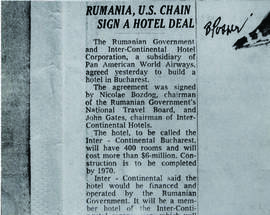 The story of Bucharest's InterContinental hotel begins in the 1960s, when Cyrus Eaton Jr. - representing the Cyrus Eaton Corporation - arrived in the city. 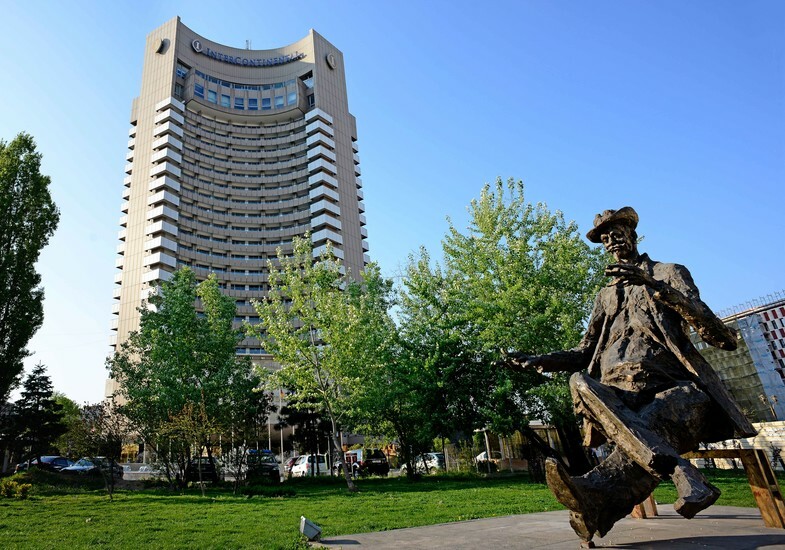 In those days, there were not too many hotels in Bucharest and legend has it he ended up sleeping in a hotel lobby after failing to find any accommodation. 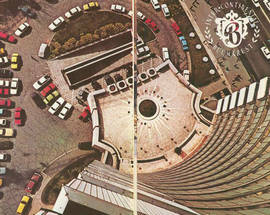 The need for a large, luxury hotel was clear and the idea of the InterContinental was born. 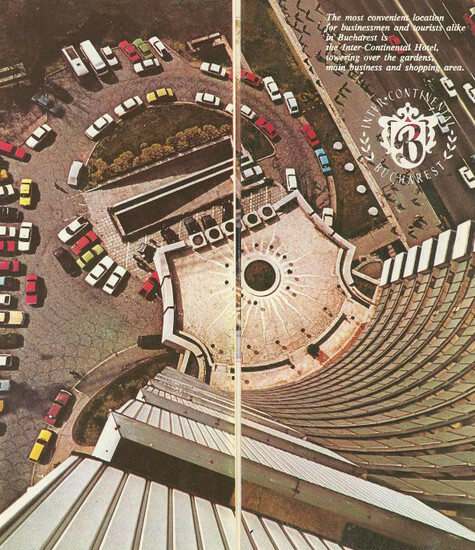 (Eaton Jr. - who had a talent for cutting through red tape - would go on to make something of a career out of opening hotels in socialist countries during the 1970s, including the Sheraton Grand Balkan in Sofia). 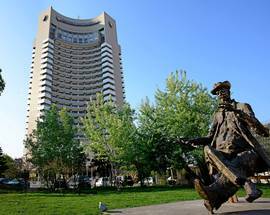 Construction of the hotel started in 1968, following the designs of four Romanian architects: Dinu Hariton, Gheorghe Nădrag, Ion Moscu and Romeo Belea; the project included also the building of the National Theatre. All the constructors and engineers were Romanians and the building was finalised in just three years. 'I proposed as locations Kiseleff Park and Piata Unirii, both of which would now be considered inappropriate. It was InterContinental representatives who came upon Piata Universitatii and that's where we built it: on the site of a former travelling circus and a traditional grill house called La Zisu. 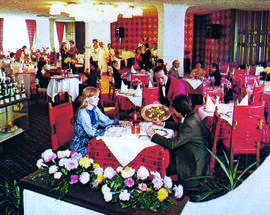 The hotel opened in May 1971, at that time the tallest building in town. Just over 86 metres high, the InterContinental is still one of the tallest buildings in the city and by far the tallest hotel. The first guests were brought to Bucharest on the first Pan Am flight to land in Bucharest. 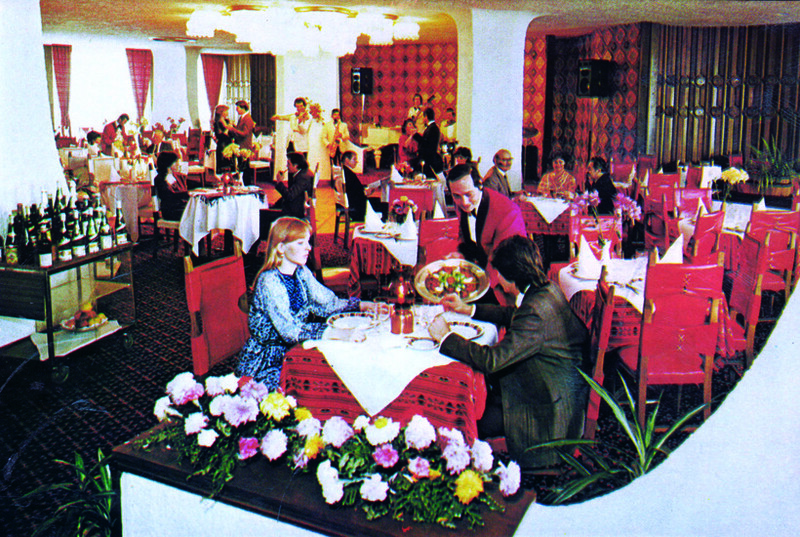 Iulian Stanciu, a chef working at the hotel when it first opened, remembers one of the most popular dishes was a crayfish tail salad. 'Our foreign guests were pleasantly surprised about the range of dishes we offered and the taste of the local fruit and vegetables. Everything we were using as ingredients was fresh and locally produced. The most appreciated dish was a cocktail made of crayfish tails, fresh salad and Calypso sauce. It sold for 17 lei (US$1.50 at that time). The InterContinental currently operates 257 rooms (from a total of 423, the rest are undergoing renovation). The biggest is the enormous, 240 square metre Imperial Apartment. It features a master bedroom – the Imperial bedroom - and a secondary bedroom for companions. 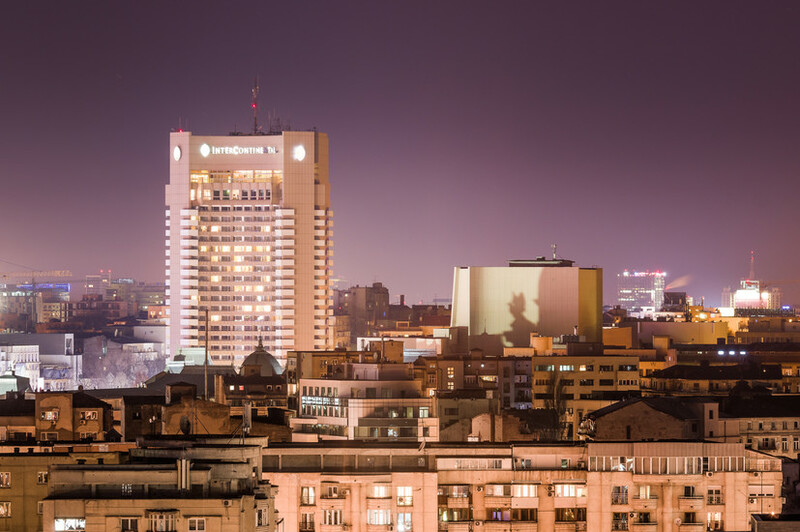 The Imperial Apartment's main windows look down to Piata Universitatii from where the VIP guest has a unique perspective over the city centre. In the living room, there is a white Steinway & Sons piano, unique in Bucharest. The lights are made from Murano glass and the main bathroom includes a Jacuzzi and private sauna. 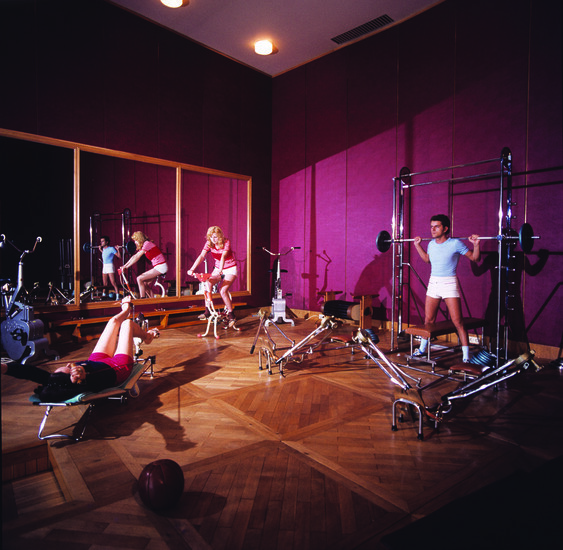 Hundreds of heads of state and stars of sport or entertainment have stayed in it, from Bjorn Borg to Queen Sofia of Spain. During the Romanian Revolution of December 1989, the hotel was the preferred base of the foreign press. Its spectacular view over city offered them the opportunity to film from their balconies. The pictures they recorded of fighting on the boulevard below were sent all over the world and heralded the end of the Ceausescu regime. 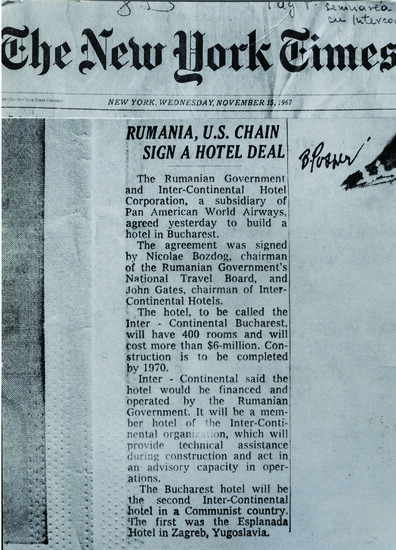 A telex received on January 5, 1990 from the InterContinental Hotels' board congratulated the employees of the hotel - who had remained in post throughout the dramatic goings on taking place in the city - for the 'excellent level of services offered to guests during the recent events in Romania. Located at the heart of the revolution, the hotel worked efficiently, gaining the gratitude of the international press.' This is the main reason visiting journalists continue to make the hotel their home when in Bucharest. 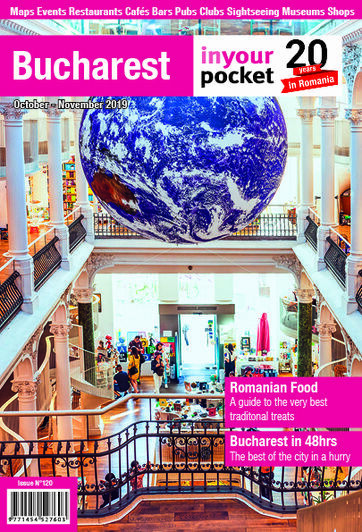 In 2015, InterContinental Bucharest won the prestigious Romania’s Leading Business Hotel at the World Travel Awards. In 2014, InterContinental Bucharest was named Romania’s Luxury City Hotel by World Luxury Hotel Awards. Other awards include Romania’s Business Leading Hotel at the World Travel Awards 2013, and Romania’s Leading Hotel at the World Travel Awards 2010 and 2011.